I gave a presentation a couple months ago at the Spring meeting of the Michigan section of the American Association of Physics Teachers highlighting a project a pair of my electronics students did last school year. My students used an Arduino to read a 250g accelerometer to investigate the force a brain might feel in a violent football tackle. From an Arduino point of view it was a trivial program. However, it was still a cool project for a variety of reasons. There were many opportunities for problem solving. 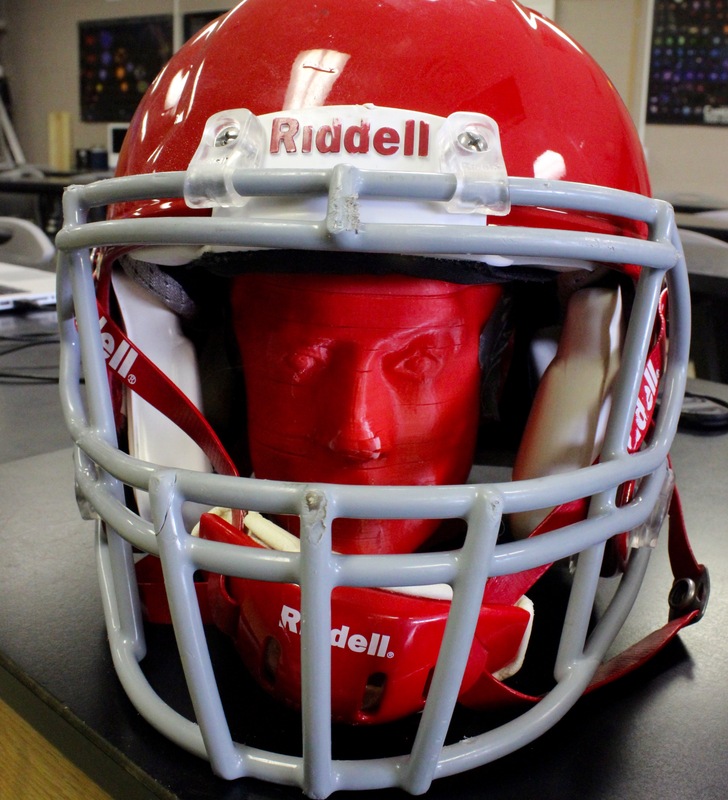 They had to figure out how to embed the sensor in a meangingfull way, mount the helmet, and simulate a rough tackle. First task was determining how to mount the sensor. They asked if they could 3D print a head. This seemed reasonable to me, but I wasn’t sure if they’d have to design it or if we could find one. The head of Stephen Colbert was readily available and made us laugh, so that’s the one we printed after modifying it to accommodate the sensor. In retrospect this was not the best head to print as Colbert’s hair when 3D printed doesn’t squish the way real hair would. For this project it worked out fine, but for a side impact would not be ideal. I really like this project because it gave students a chance to investigate something of interest to them that is also very topical. As football players, this was of direct interest to them and something with wider potential impact as well. When they finished it I immediately wanted to share this project with other physics teachers. It would be cool to see other teachers working with their own students to do similar projects. However, whenever I try to show teachers how to use Arduinos to collect data, their eyes start glaze over as soon as the code hits the screen. I decided to attempt to meet my physics colleagues where they are rather than where I am. Most of the physics teachers I know have access to either Vernier or Pasco interfaces and sensors. At our school we have Vernier, so that’s what I used. I assume you could do something very similar with Pasco equipment. Vernier sells a cable you can use to make your own analog probeware. It turns out this was very easy to attach to our $30 accelerometer. The Black Wire goes to GND, the Orange Wire is +5V so goes to the VCC, and the Red Wire attaches to OUT. The other wires were not used. All you need to do is solder these three wires to the sensor and plug it into a LabQuest or LabPro. This is something pretty much anybody can do. 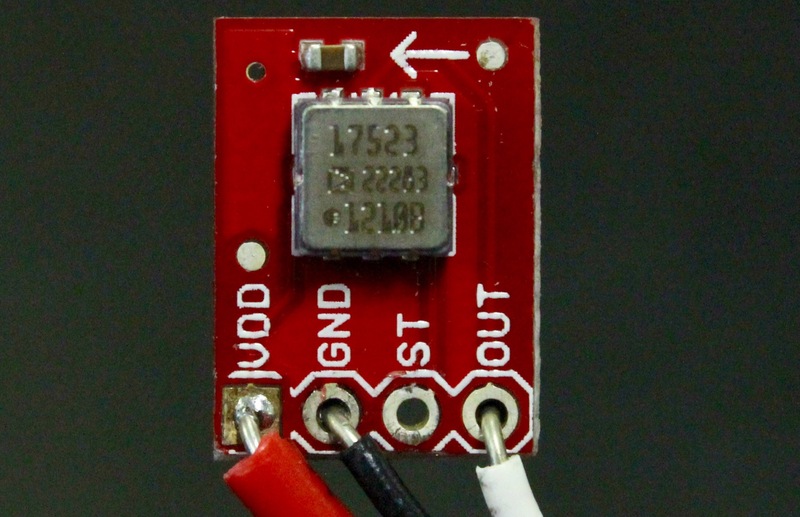 However, if you’ve never soldered before I recommend this tutorial from SparkFun Electronics. The 250g Accelerometer we used is an analog sensor. This makes it easy to interface with Vernier hardware. Nerd Alert: If you need to know, basically we are using it as a voltage comparator. On the LabQuest (or LabPro) we set up our sensor to read Raw Voltage (0 – 5V). For our sensor, zero volts corresponds to -250g’s, five volts with 250g’s, and at 2.5 V we have zero g’s. In reality the 5 V wire gave me 5.2 V (the USB standard is 5 V but can be up to 5.25 V or as low as 4.4 V), so zero g’s was at 2.6 V and 250 g’s would be 5.2 V. Since the output from this sensor is linear, I used the LoggerPro program to convert the voltage readings to g’s by creating a “New Calculated Column”. I ended up with a slope of (500 g’s)/(5.2 V) and a y-intercept of -250 g’s. The graph of my calculated column resulted in a graph of force vs. time. In the example graph below, the hit lasted for about 0.003 s and reached a peak of just over 63 g’s. Based on readings from the literature, a hit of this magnitude and duration would be unlikely to cause a concussion. With the growth of the Maker Movement there are now a lot of cheap sensors out there that can be interfaced in exactly the same way. Adafruit makes a 200g 3-axis accelerometer that looks promising, but you’d need 3 Vernier cables to read all thee axises simultaneously (also true with Vernier’s 3-Axis Accelerometer). I’ve also been thinking about using some flexiforce pressure sensors to measure the force/area actually applied to the head in a collision. This would be a simple modification of this lesson on the Vernier site. Tomorrow, Saturday 10/4/14, is the fall meeting of the Michigan Section of the American Association of Physics Teachers. If you’re interested, it will be at the University of Michigan, Flint. For more information you should check out the meeting page. Anyway, Jim Gell and I will be running a Make and Take in the afternoon. One of the things we will be doing again is the ever popular LED Color Mixer. We’ve done this before as a modified version of the LED mixer presented by Chris Chiaverina in the Physics Teacher. This is a pretty cheap demo device, but in the past we ordered $1-2 LED, $1 battery holder, $0.50 ping pong ball, and 2 AA batteries. Cost for each one was between $3 and $4. This was a bit costly to run as a Make and Take. It also involved soldering, which while not particularly difficult did require the direct supervision of someone. We will be doing the same project on Saturday at a cost of less than $0.20/device with no soldering required. This project is cheap enough that you can have participants make one on site and then send them home with a couple extras to make with their classes. They’re so cheap that a teacher could have each of their students make one to take them home and explain how they work to their families. I should note that while both the batteries and LEDs are sourced from Amazon, the LEDs come from China and will take a few weeks to arrive. While the LEDs are cheaper than we’ve been able to get them in the past the real savings is from the batteries. In order to make things extra cheap I replaced the ping pong ball with a paper cube. Simply bend the leads on the LED as shown. The shorter of the two leads goes to the negative side of the battery with the longer going to the positive. Use a little electrical tape to hold the leads to the battery. If needed, slip a small strip of overhead transparency in between one lead and the battery to act as an “off switch”. Print out a copy of the 2.25″ Cube Template and assemble. Before closing the last flap put 1/2 a Kleenex in to help diffuse the light and cut a hole in one side. The simply slip your LED and battery in and bask in the color changing goodness you have created. How would you use this with your students? Share your thoughts in the comments. If you follow my blog you know I’m a big fan of the new iBooks and iBooks Author. What I wanted to mention today is a cool tool called GeoGebra. It’s pretty cool. After playing with it a little I see some real potential here not only for math, but also science. Below is an interactive I made after playing for only a few minutes. It models a position time graph for an object moving with a constant velocity. You can change the Velocity or the Starting Position (xo). It literally took me no more than ten minutes to make this having never worked with GeoGebra before. Anyway I was looking at GeoGebra as a way of creating interactive content for iBooks. Anthony DiLaura (@anthonydilaura) has been doing this already. He uses Tumult Hype to take GeoGebra output and get it into a widget for embedding in iBooks. I’ve come up with a slightly different way and easier way, but Anthony’s way is better in some ways. Download my sample widget and unzip. Embed your widget in iBooks! I should note one thing. This method will only work if you have an internet connection to the iPad when you’re using it. I have been a bit daunted when it comes to making offline widgets. Check out this discussion forum if you want to try to create widgets for offline use. Well, as of this morning my handouts still haven’t appeared on the ISTE-NECC site for my session, so I’ve converted my pdf files to jpg and uploaded them to Picasa Web Albums (owned by Google). Here are all the handouts I had posted to the backboard behind my table. I created them using Comic Life on my MacBook.